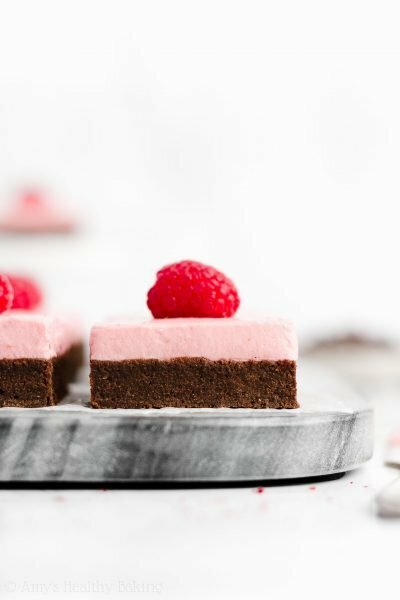 Chocolate graham crackers filled with cheesecake-flavored frozen Greek yogurt studded with berries. 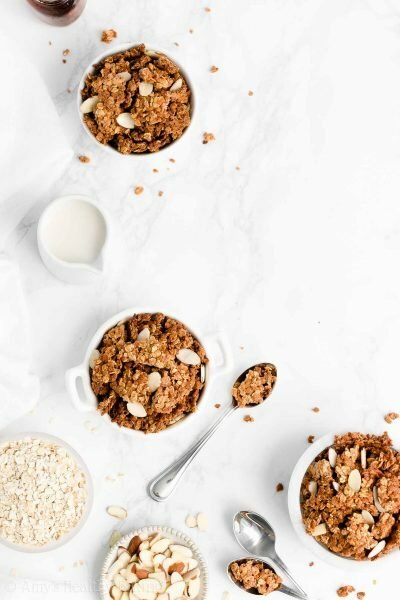 A light & healthy summer treat! This past Thursday afternoon, I cruised down the freeway for an hour and a half to my hometown. I skipped straight past my parents’ place (although I did double back by later!) and eased to a stop right outside Jane’s home, the blogger behind The Heritage Cook. As the first person I met in Miami and BlogHer Food last month, it turned out she actually lives in the same tiny city I grew up—barely 2 miles from my house! After figuring out that bizarre tidbit, we spent the entire conference weekend together and immediately became fast friends. With both of our birthdays falling in June, she invited me to celebrate with her at a cooking class hosted by Draeger’s in the Bay Area. Jeni, the brilliant woman behind Jeni’s Splendid Ice Creams taught the session. To promote her latest cookbook, Jeni’s Splendid Ice Cream Desserts, she shared the recipes for three of her sweet frozen treats. With a short 2-hour slot, Jeni briefly touched upon the science of ice cream and demonstrated how to make her most famous sweet cream base. We all looked on in amazement—that recipe contained absolutely no eggs! 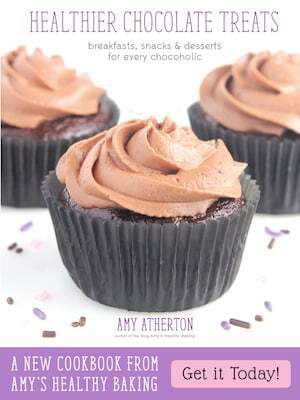 After whisking together the ingredients, she set the mixture on ice before working true TV switch-a-roo magic and pulling out a tray from behind the counter, freshly chilled from the freezer. Paired with her sweet cream shortcakes and fresh sugar-coated strawberries, Jeni’s Sweet Cream Strawberry Shortcake may have been my favorite baked treat… Thank goodness Janie is gluten-intolerant—I quickly gobbled up her shortcake pieces too! Jeni also taught us to make chocolate-glazed cream puffs and ice cream parfaits. I nearly licked my plate to avoid wasting a single drop of her salty vanilla frozen custard inside of the pâte à choux, and I wouldn’t have cared if any of our prim and proper classmates disapproved… It was that incredible! Her parfait perfectly captured her taste-pairing talent, stemming from her previous work in perfumes. The individual components, decent on their own, banded together in a mesmerizing symphony of flavors: bright citrus from the lemon curd; sweet richness from the juniper ice cream and whipped cream; and summery memories from the blackberry jam. I basically polished off every spoonful of that too! As much as I enjoyed her decadent desserts, I knew my swim suit probably wouldn’t approve of my indulging in them night after night… So I decided to develop a lighter frozen treat of my own. The result? 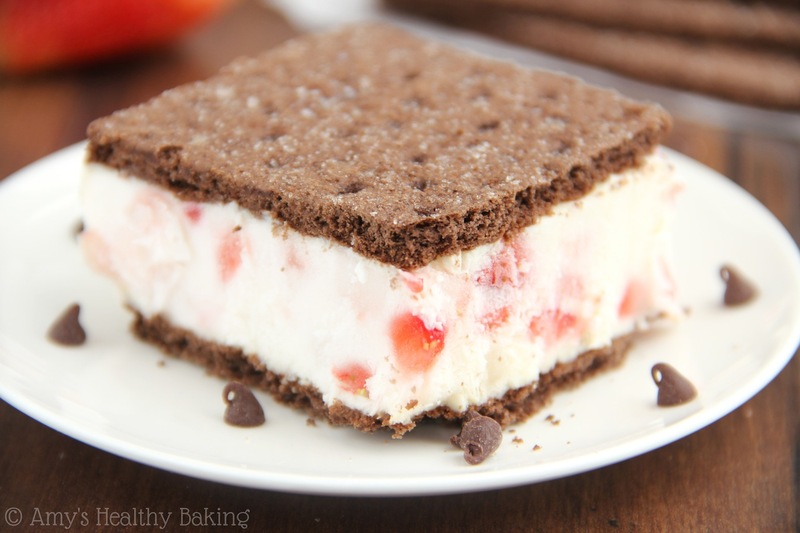 These Skinny Strawberry Cheesecake Frozen Yogurt Sandwiches! Studded with bright fruity bits, the sweet filling contains just enough tang to captivate your taste buds, while the dark chocolate graham crackers lend a subtle richness to the lighter summery dessert. 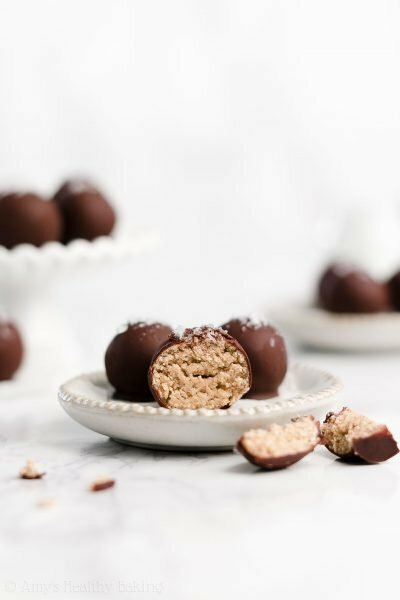 With very little sugar and almost no fat, these low-calorie treats provide the perfect skinny solution for your sweet-tooth fix! 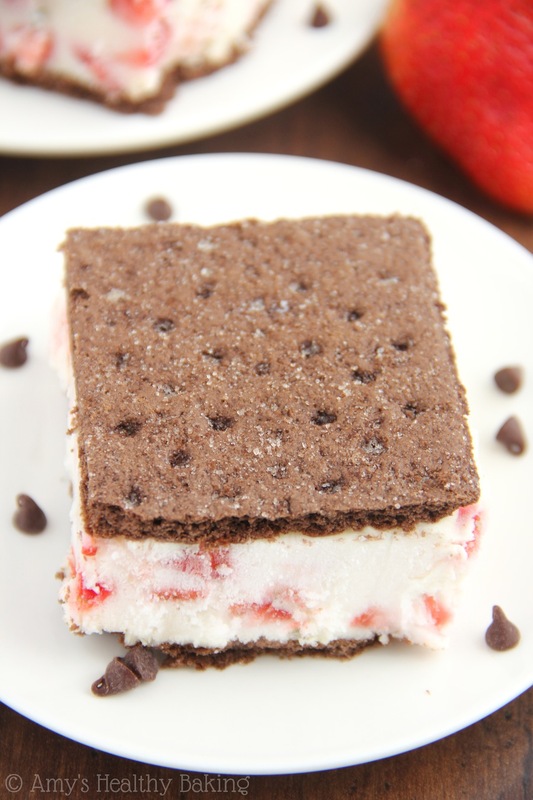 Not only are they healthy, these froyo sandwiches are super simple to make. You just need 5 ingredients: chocolate graham crackers, Greek yogurt, instant pudding mix, sweetener, and strawberries. That’s it! Really, I promise. The hardest part is arranging the graham crackers in the 9” x 5” loaf pan! Line the pan with foil, making sure that the corners are as close to right angles as possible. (We want to avoid rounded edges for the prettiest presentation!) Lay down 3 square and 3 rectangular graham cracker sheets inside; then lift up the sides of the foil so that they’re touching the graham crackers. Gently shove paper towels into the gaps to hold the foil in place. See the photo below? That’s what the graham crackers should look like! I placed my paper towels in between the pan and foil on the top and right sides. Now spread the cheesecake yogurt filling on top, and gently press down the remaining graham cracker lids. Lay a sheet of plastic wrap on top to help prevent ice crystals from forming on the sandwiches, and freeze the pan until the filling is just barely firm. You still want the sandwiches to be soft enough for you to slice through them! If you forget about your froyo sandwiches in the freezer (like I did), leave the pan out on the counter for a few minutes. Run your knife under hot water, wipe off the moisture, and carefully ease it into the frozen yogurt. Be gentle to avoid ragged edges! Once sliced, lift the foil out of the pan, peel down the sides, and tightly cover each sandwich in plastic wrap. I used 2 layers to be safe and guard against freezer burn. Then seal the sandwiches in a zip-topped bag, and stick them back in the freezer. 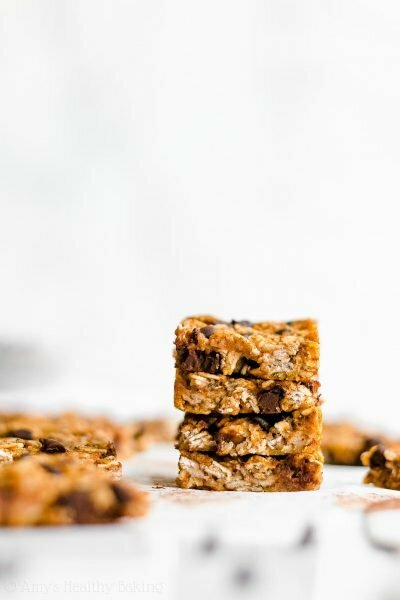 Because they contain very little fat and plenty of frozen fruit chunks, the filling inside will be very hard and icy when you first pull them out to eat—but they thaw really easily in the microwave! (See the recipe below for my guidelines on time.) 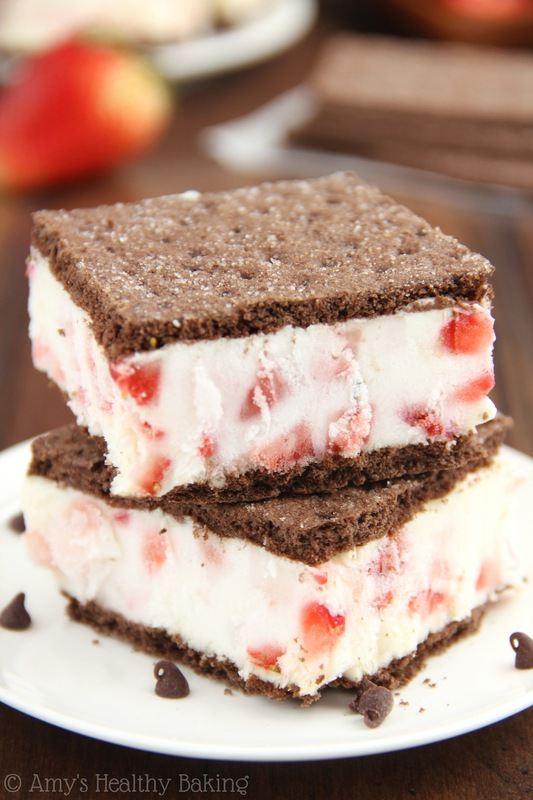 Because the pudding mix thickens the yogurt really well, the centers don’t really melt and drip like regular ice cream sandwiches, so they’re much less messy… And you don’t have to eat them as quickly either! Always a huge plus when you love savoring your sweets like me. 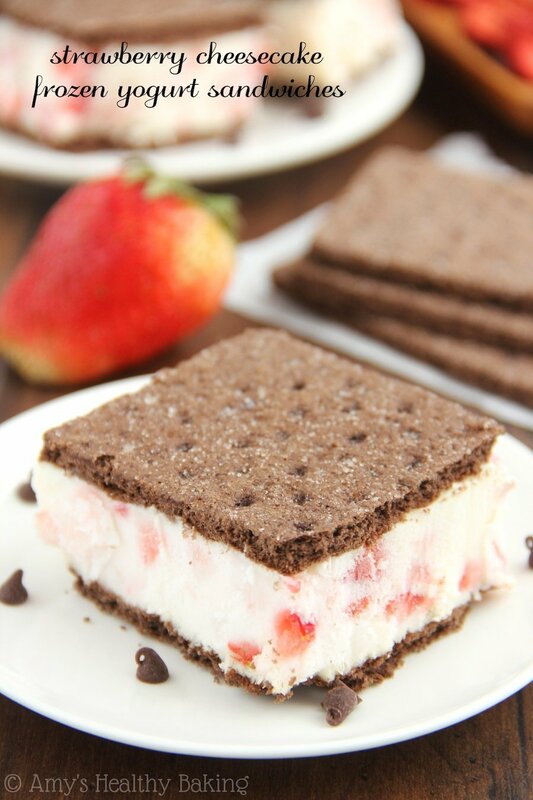 Sweet, simple, and extremely satisfying, these Skinny Strawberry Cheesecake Frozen Yogurt Sandwiches cool off any warm summer day with their refreshing taste. 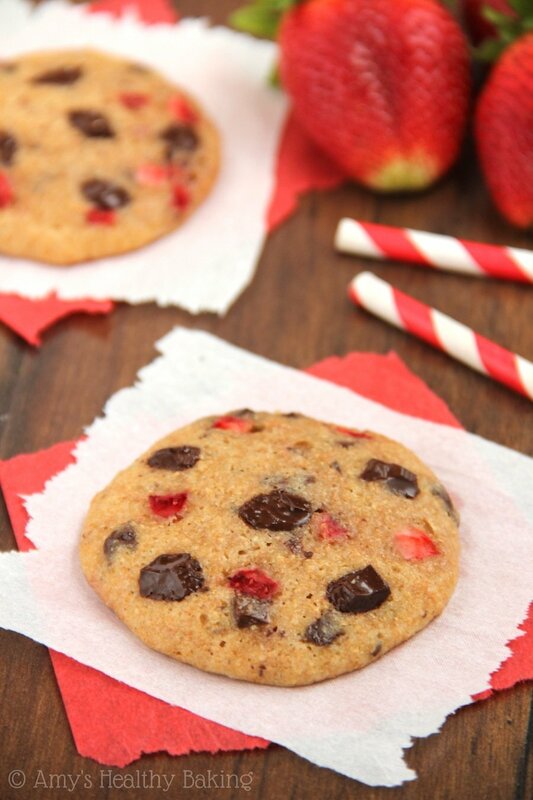 They’re the perfect swim lesson reward, light afternoon snack, or backyard BBQ treat. 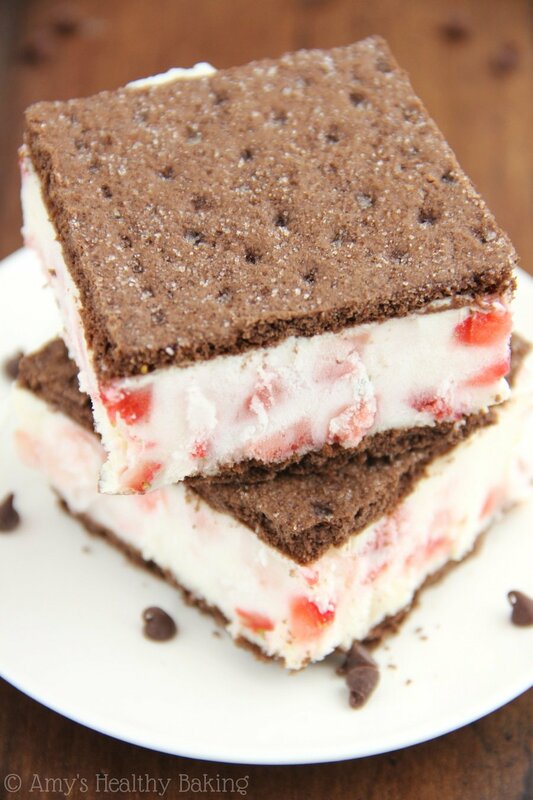 But you might want to make a double batch… With their fun flavor, these froyo sandwiches disappear much too quickly! P.S. Don’t forget to enter the Cascade Ice Giveaway before July 1! 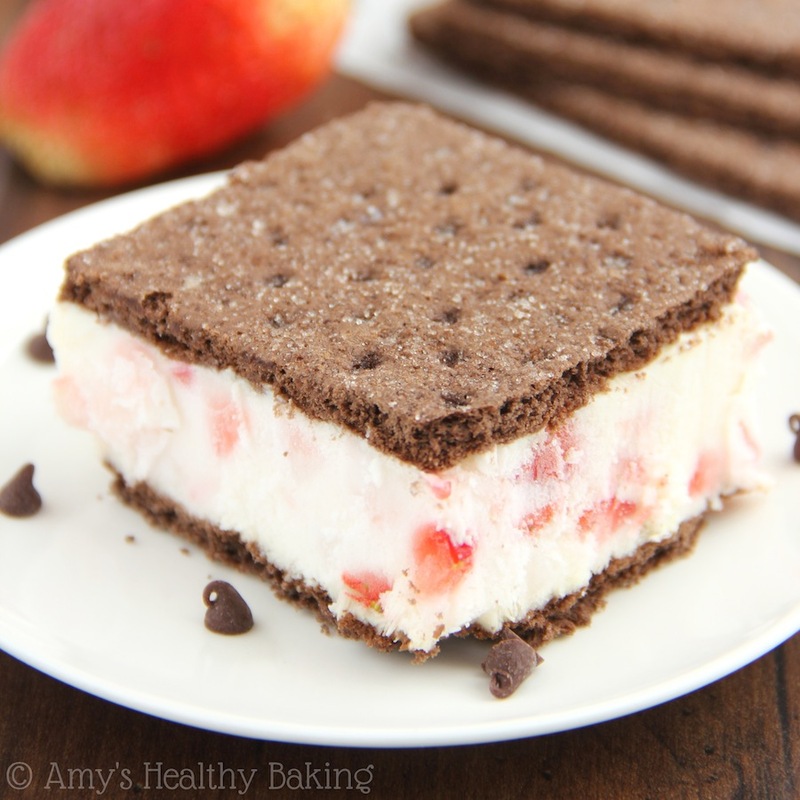 These healthy frozen yogurt sandwiches are the perfect light summery treat! 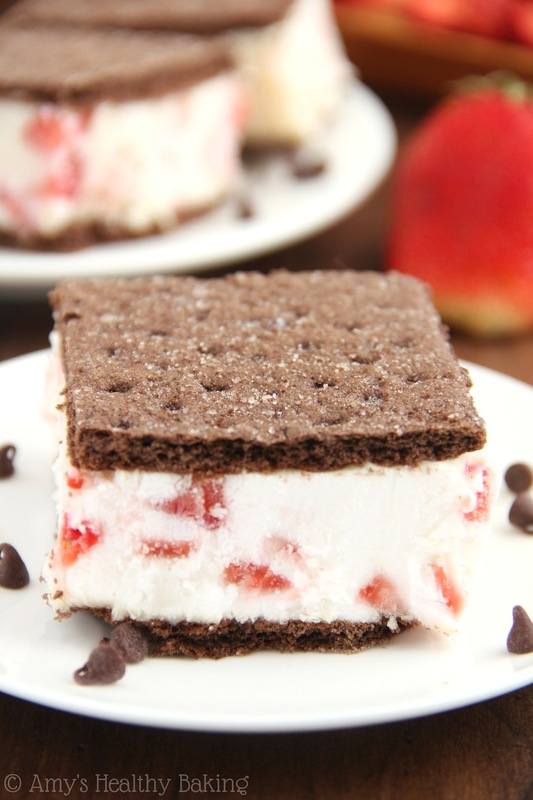 Feel free to substitute your favorite berries, or switch to honey or cinnamon graham crackers for a fun twist. Carefully cut or break the 4 whole graham cracker sheets into halves. Cut 3 of the halves into half again. You should have 6 larger squares and 6 smaller rectangles. Line a 9”x5” loaf pan with foil. Place 3 larger squares top-side down along one of the 9” sides, and place 3 smaller rectangles next to them. (See photo in blog post above for a visual.) Bring the sides of the foil up snuggly against the sides of the graham crackers, and place a few paper towels between the foil and the pan’s edges to hold the foil in place. 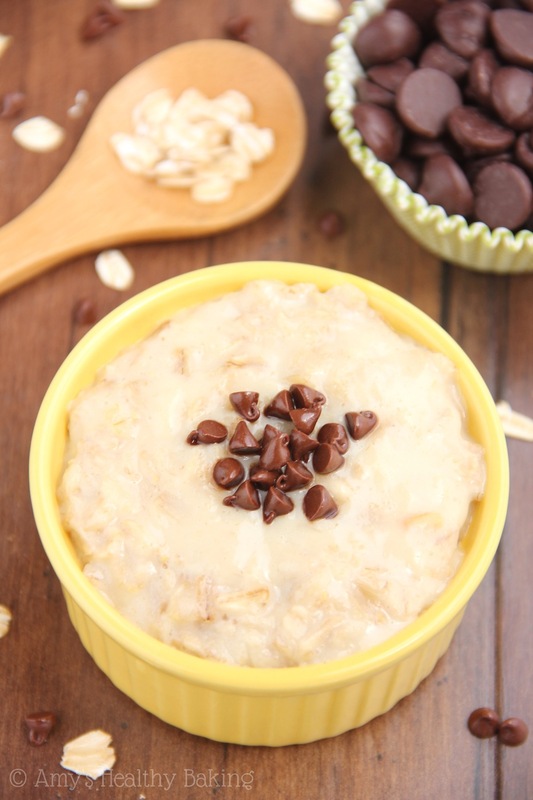 In a large bowl, beat the yogurt, pudding mix, and Truvia for 1-2 minutes or until thick. Gently fold in the diced strawberries. Evenly spread the yogurt mixture on top of the graham crackers in the pan. Top with the remaining graham crackers, top-side up. Make sure the foil is touching the sides of the top layer of graham crackers. Lay a piece of plastic wrap on top of the graham crackers, and place the pan in the freezer for 1-2 hours, or until the bars are barely firm. Remove from the freezer and take off the plastic wrap. Run a knife under hot water, and wipe the blade dry. 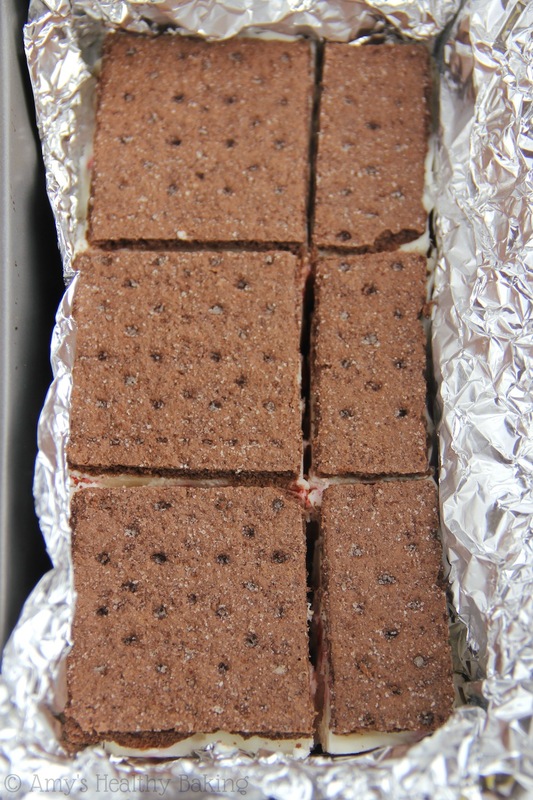 Carefully slice through the frozen filling along the edges of the graham crackers to make 3 larger square sandwiches and 3 smaller rectangular sandwiches. Tightly wrap each sandwich in plastic wrap, and place in a freezer-safe zip-topped bag. Freeze until ready to eat. 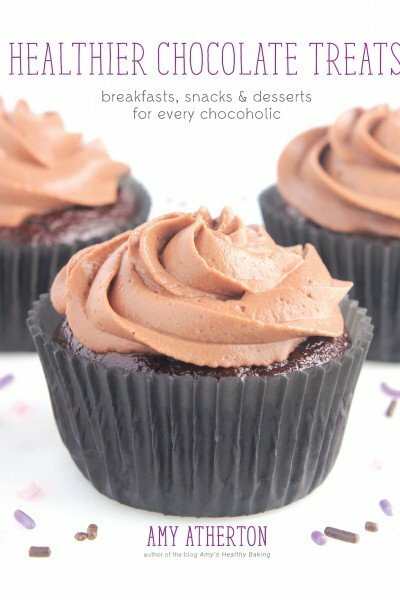 Before eating, thaw on the counter or in the microwave. For the larger square sandwiches, thaw at 30% power for 35-40 seconds. For the smaller rectangular sandwiches, thaw at 30% power for 25-30 seconds. Notes: Just use the powdered pudding mix; do not prepare it according to the package directions. Most cheesecake-flavored sugar-free, fat-free instant pudding mixes come in a 1 oz box with 4 servings, but if yours is different, just use the equivalent of 1 serving of the powder. 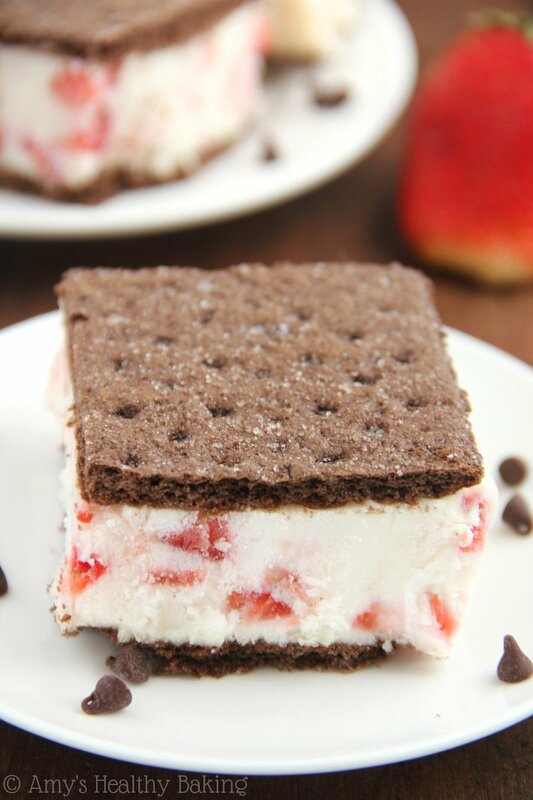 I prefer fresh strawberries for these froyo sandwiches because they don’t bleed as much when folded into the yogurt. If you use frozen, let them thaw for a few minutes just until they’re easy enough to slice; do not let them come all the way to room temperature. You can also make 9 smaller rectangular sandwiches instead by slicing the 6 larger square graham crackers before layering into the pan. A flavor of Pudding is not mentioned. I’m assuming Cheesecake or is it vanilla? Thank you so much for catching that Barb! 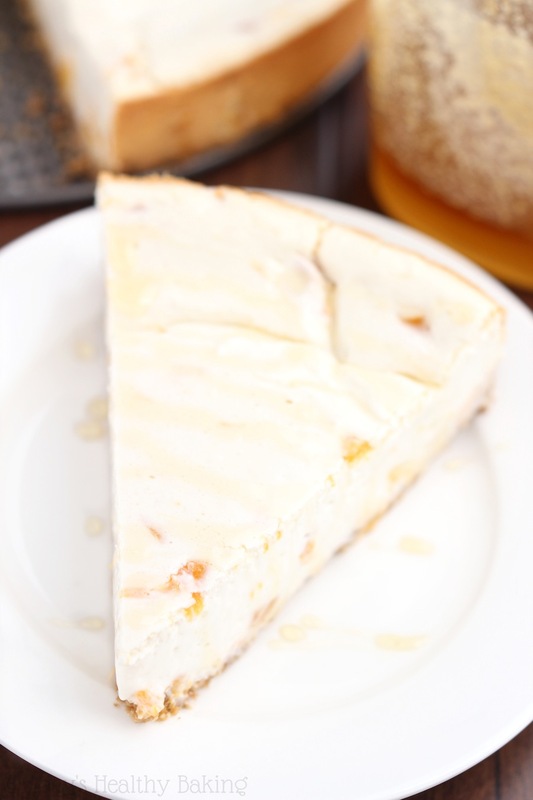 Yes, you’re right — it’s supposed to be cheesecake. I’ve updated the recipe, so hopefully it’s clearer now! Thank you so much. Can’t wait to try it out! You’re welcome Barb! I’m excited to hear what you think!